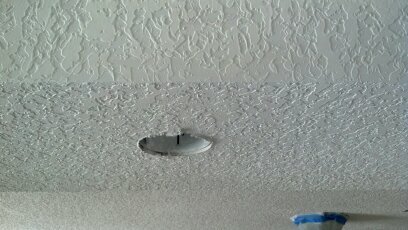 The interior portion of this house painting project included some minor drywall repair and texture application. When a Peerless Painter is filling in small nail holes and imperfection in your drywall our process includes. Our Tampa house painters have found that when taking the time to fill holes and imperfections correctly, your wall will come out smooth and clean after painting. Some of the areas in the kitchen received knock down texture. This area was primed and then painted with two coats. The office color was a rich canterbury red with white semi-gloss. All of the doors and trim work was sprayed, the walls were rolled including the ceiling to avoid over spray particles. 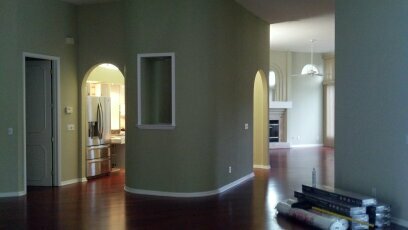 The main living room was a sage green with semi-gloss. This picture displays the room after we had removed all of our plastic and drop cloths. The last portion of this house painting Tampa project is to stain the garage floor. 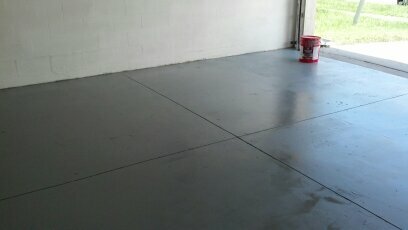 When using a xylene garage floor stain, you must always first acid etch the concrete. We used a muriatic solution first followed with caustic soda beads rinse. The coating is then applied in a cross hatching application after drying. It is important to note that soft high performance tires will leave marking on the stain if not allowed to cool off. 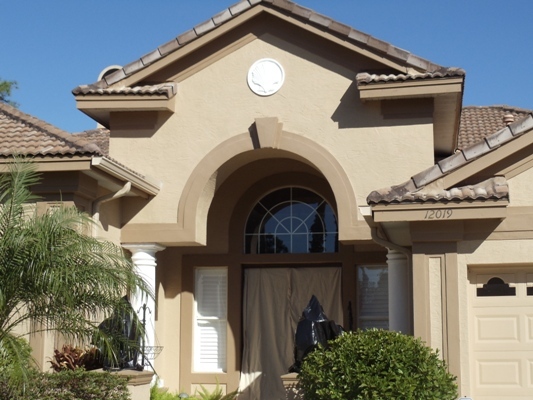 Peerless house painting Tampa provides prompt on time house painting for the entire metro areas. Inside or out you can count on the pro’s at Peerless to perform the proper prep work and use quality materials. Call us or fill out a contact form more information.